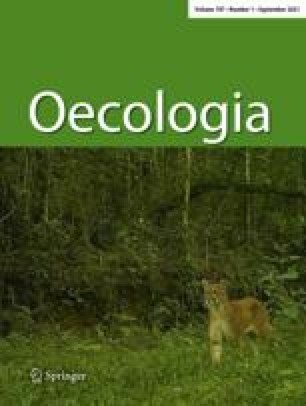 It has been reported that when the vegetarian Bush hyrax Heterohyrax and the Rock hyrax Procavia are allopatric they occupy an almost identical niche, while when sympatric they differ in feeding behaviour. To investigate whether indeed a displacement in feeding behaviour takes place where Procavia johnstoni and Heterohyrax brucei occur sympatrically, the feeding characteristics of three (two H. brucei, one P. johnstoni)allopatric family groups and four (two of each species) sympatric family groups living on five kopjes in the Serengeti were studied and compared. The vegetation of these five kopjes was surveyed. It was divided into four classes (grass, forb, bush, tree), the plant species identified and the indices of diversity and similarity calculated. The plant biomass was roughly quantified through a foliage density (f.d.) factor and the seasonal variation of vegetation recorded. The number of plant species ranged from 65 to 95 (Fig. 4). The closer the kopjes are geographically, the greater the resemblance in their plant species composition (Fig. 6). Although bushes and trees comprise the fewest plant species (15–27%) they form the highest foliage density values (65–85%; Table 1, Fig. 5).There is a substantial variation of plant species diversity. A significant correlation exists between the diversity indices and crown cover, but there is no correlation between diversity indices and a) kopje area or b) the quotient of total number of hits per transect length. Grasses, forbs and small bushes observe more or less the rainfall pattern, while other bushes, and trees, never completely lose their leaves (Fig. 7). The behaviour of individuals in the groups was regularly observed and recorded in the wet and dry seasons. H. brucei was observed feeding on 64 plant species (Annex A) but 2\2-11 species formed 90% of the animals' staple diet. There is a high correlation (rs=0.90) between the comparative abundance of vegetation (measured by f.d.) and the proportions of the four vegetation classes eaten by H. brucei (Fig. 8). All four family groups fed roughly in proportion to the foliage density, yet showed preference for certain plant species. They browsed predominantly on bushes and trees in the wet (81%) and dry (92%) seasons (Fig. 11), but showed a tendency to eat more grass and browse less in the wet season. There are marked differences in feeding between the family groups, due to selective preferences and the vegetation composition in the respective kopjes (Table 2, Fig. 10). P. johnstoni was observed feeding on 79 plant species (Annex A). The animals have a high seasonal adaptability: in the wet season they showed a high preference for grasses (78%), but in the dry season when grasses became parched and poor in quality they browsed (57%) extensively (Fig. 11), and more or less in proportion to the foliage density of each vegetation class (Fig. 9). P. johnstoni must go outside the kopje to graze. Around one kopje the cropped grass area was very marked, its size varying with rainfall (Figs. 12 and 13). Competition for food could occur especially in the dry season when both species browse. However, no evidence could be found for a competition-induced displacement here. Almost no aggressive behaviour was observed between the species. Both P. johnstoni and H. brucei have morning and evening feeding activity peaks in the wet and dry seasons, the evening one always being higher (Fig. 14). There was no indication in sympatric groups of any activity shift induced by the presence of the other species. Evidence on the social character of group feeding and the guarding function of the territorial ♂ ♂ is presented. The results obtained are compared with those of other authors. There is no indication of niche segregation in sympatric kopjes. Possible climatic and other reasons for regional sympatry are discussed. The advantage of selecting food items rich in protein and energy and low in fibre content are considered and food competitors listed. Serengeti Research Institute publication no. 209.